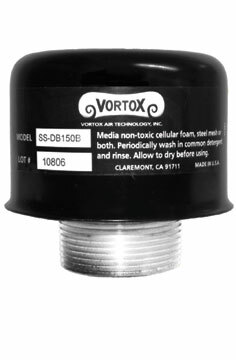 Stainless Steel Breather Caps l Vortox Air Technology, Inc.
Vortox Air Technology, Inc. Breather Caps are designed to be used in both negative and positive pressure atmospheres. In negative pressure, the initial media filters out contamination in the air stream that could potentially harm internal components. When used in a positive pressure application, oil and dirt are captured in the filter media contained within the internal reservoir. As air flow stops, the oil will flow back to its source from the reservoir. The outer media serves as a secondary filter prior to the air re-entering the atmosphere oil free. Standard Filter Media is a non-toxic, washable cellular foam. Alternate media of either steel or stainless steel mesh is also available. Periodically inspect for accumulation of dirt. Remove Breather Cap, wash in common detergent and rinse. Allow media to dry, then reinstall Breather Cap. Copyright © 2019 Vortox Air Technology, Inc. All Rights Reserved.